Welcome To C2C Gallery in Grand Haven, Michigan! 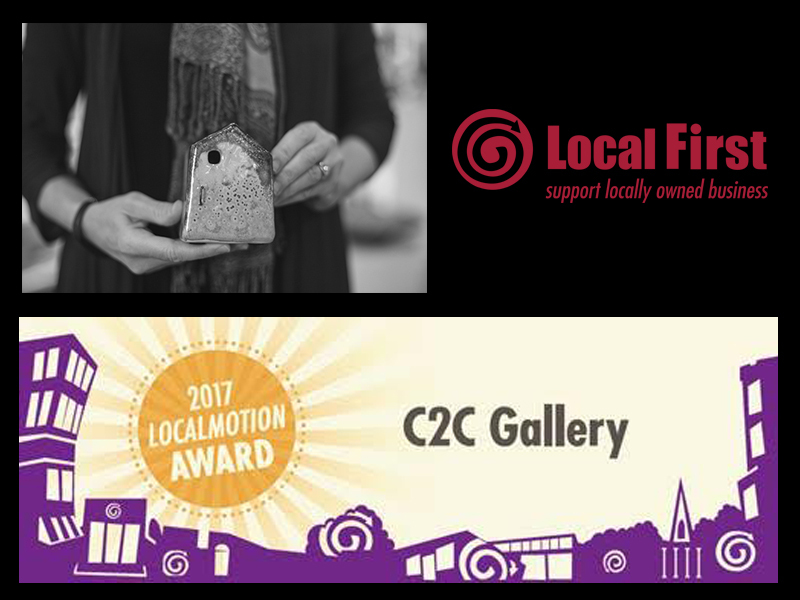 Casemier, owner of C2C Gallery in downtown Grand Haven, has been awarded a Local Motion Award from the Grand Rapids-based Local First of West Michigan non-profit organization. Local Motion awards are given to organizations for their commitment to social, environmental and economic responsibility, according to the Local First website. Casemier said when she was filling out the paperwork for the award, she realized she had done much more than she realized. “I’ve organized a lot of things for a lot of different groups,” she said. That includes Friday Art Hops. Every first Friday of the month, she hosts a local musician and offers free music to the public. She also hosts an artist in-store. Casemier also organized an ArtWalk field trip for fourth-graders. In 2012, Casemier organized the Grand Haven High School ceramic show. “We had three other artists and myself jury student work in ceramic and jewelry,” she said. Casemier hosted the winner at the art gallery and invited the public to attend. Student musicians performed during the event. The juried art then was displayed in downtown storefronts. Casemier said the Local Motion award will help promote C2C gallery as “a gem along the Lakeshore.” She said it will also spur her into future projects.